RSC Associate Artist Richard McCabe has agreed to talk to the RSC Friends while in Newcastle with the tour of Yes, Prime Minister. 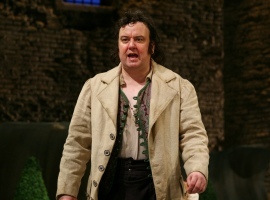 Richard has had an extensive and varied theatrical career spending much time with the RSC. He is no stranger to Newcastle, last appearing in the title role in King John. Alongside this he has made many TV appearances, the most recent in the series Wallander. His broad film career includes The Duchess, The Constant Gardener and Notting Hill. Olivier Suite, Theatre Royal, Newcastle. Tickets cost £5 for RSC Friends and £6 for guests. Booking closes on 23 February at 3.45pm.